As Founder and Director of Iconic Consulting Ltd. in London, Benjamin Erben has run his own agency for 10 years. With more than 20 years in the creative businesses, he has progressed from design to branding, from visual to content. 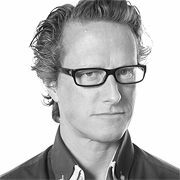 Before starting Iconic Consulting, Benjamin Erben worked as a Brand Strategist for Deepend, as a Creative Director for Grey Matter Williams & Phoa, as well as a Senior Designer for Pentagram. He lives between both London and Berlin and received his degree in Communication Design in Berlin.